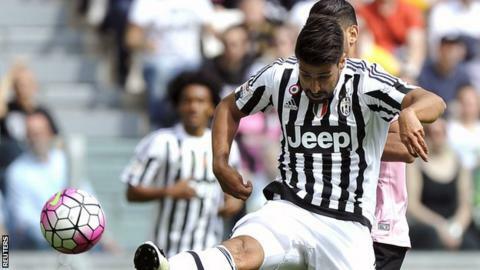 Juventus moved within touching distance of a fifth successive Serie A title by cruising past lowly Palermo. Germany midfielder Sami Khedira controlled Paul Pogba's pinpoint pass with his chest to fire in a stunning volley from 15 yards on 10 minutes. Pogba added the second after break, eluding his marker at the far post to bundle in Alvaro Morata's flick. On-loan Chelsea winger Juan Cuadrado whipped in from 18 yards, before Simone Padoin slid in a late fourth. Juve are nine points clear of second-placed Napoli with five games left. Massimiliano Allegri's team could clinch the Scudetto at Fiorentina next weekend - if Napoli drop points against Bologna on Tuesday and Juve beat Lazio on Wednesday. However, Juve could be without Italy midfielder Claudio Marchisio for the run-in after he was taken off on a stretcher with a knee injury. Meanwhile, Francesco Totti came off the bench to score a late equaliser for Champions League-chasing Roma in a thrilling 3-3 draw at Atalanta. The 39-year-old forward earned a potentially vital point for the Giallorossi when he drilled in with five minutes remaining. Roma led 2-0 after strikes from France left-back Lucas Digne and Belgium midfielder Radja Nainggolan, but Luciano Spalletti's side allowed the bottom-half hosts back into the game. Former Roma midfielder Marco D'Alessandro reduced the deficit on 33 minutes, before Marco Borriello - another ex-Giallorossi player - netted twice after the break to put Atalanta ahead. However, Roma legend Totti - whose contract expires at the end of the season - levelled just eight minutes after replacing Daniele De Rossi. Third-place Roma remain in Serie A's final Champions League spot, although Inter Milan are only four points behind with five games left. Fiorentina remain on course to clinch Europa League qualification after Paulo Sousa's fifth-placed side won 3-1 against Sassuolo. At the other end of the table, Frosinone boosted their survival hopes by nicking an injury-time 2-1 win at bottom club Verona, while fifth-bottom Udinese are five points clear of the relegation zone after a goalless draw against Chievo. Match ends, Juventus 4, Palermo 0. Second Half ends, Juventus 4, Palermo 0. Foul by Mario Lemina (Juventus). Attempt missed. Álvaro Morata (Juventus) left footed shot from outside the box is too high. Assisted by Mario Mandzukic. Foul by Simone Padoin (Juventus). Goal! Juventus 4, Palermo 0. Simone Padoin (Juventus) right footed shot from the centre of the box to the bottom left corner. Assisted by Álvaro Morata. Mario Lemina (Juventus) wins a free kick in the defensive half. Foul by Andrea Rispoli (Palermo). Aleksandar Trajkovski (Palermo) wins a free kick on the left wing. Attempt missed. Achraf Lazaar (Palermo) left footed shot from outside the box is close, but misses to the left following a corner. Corner, Palermo. Conceded by Daniele Rugani. Álvaro Morata (Juventus) is shown the yellow card. Hand ball by Álvaro Morata (Juventus). Attempt blocked. Franco Vázquez (Palermo) left footed shot from the right side of the box is blocked. Foul by Antonio La Gumina (Palermo). Corner, Palermo. Conceded by Gianluigi Buffon. Attempt saved. Achraf Lazaar (Palermo) right footed shot from outside the box is saved in the top left corner. Assisted by Gastón Brugman. Attempt missed. Álvaro Morata (Juventus) header from the centre of the box misses to the left. Assisted by Juan Cuadrado with a cross following a set piece situation. Simone Padoin (Juventus) wins a free kick on the right wing. Foul by Sinisa Andjelkovic (Palermo). Substitution, Juventus. Simone Padoin replaces Sami Khedira. Delay in match Patrice Evra (Juventus) because of an injury. Delay in match Sinisa Andjelkovic (Palermo) because of an injury. Sinisa Andjelkovic (Palermo) wins a free kick in the defensive half. Corner, Juventus. Conceded by Giancarlo Gonzalez. Goal! Juventus 3, Palermo 0. Juan Cuadrado (Juventus) right footed shot from the centre of the box to the top left corner. Substitution, Palermo. Antonio La Gumina replaces Edoardo Goldaniga. Álvaro Morata (Juventus) wins a free kick in the defensive half. Goal! Juventus 2, Palermo 0. Paul Pogba (Juventus) left footed shot from very close range to the bottom right corner. Assisted by Álvaro Morata with a headed pass following a corner. Corner, Juventus. Conceded by Andrea Rispoli.